Super Savings Item! Free Shipping Included! 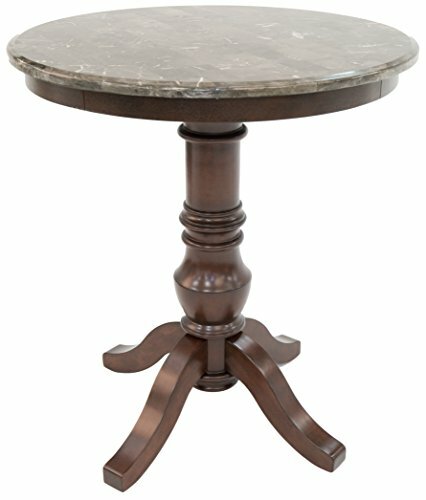 Save 38% on the Impacterra Georgia Bar Table, Cosmo Amber/Mesa Twilight, Bar Height by Impacterra at Main Street Living. MPN: GA-520-40-COA-810-MET. Hurry! Limited time offer. Offer valid only while supplies last. The GA-520 is a classic wood piece with a round top and splayed legs. It features a sturdy birch frame in brown Cosmo Amber or black Ebony finish. The GA-520 is a classic wood piece with a round top and splayed legs. It features a sturdy birch frame in brown Cosmo Amber or black Ebony finish. Cosmo Amber frame is available with the matching wood top, dark-hued faux stone top, tan granite top, or multicolored stone veneer/marble top. Ebony frame is available with the matching wood top, dark-hued faux stone top, black-red granite top, or multicolored stone veneer/marble top. Wood is intentionally distressed for a natural look and is not a defect. Available in 36" counter or 40" bar height. If you have any questions about this product by Impacterra, contact us by completing and submitting the form below. If you are looking for a specif part number, please include it with your message.